At Your Choice Vending, we have the snacks to satisfy any hunger pangs and the drinks to quench any thirst. 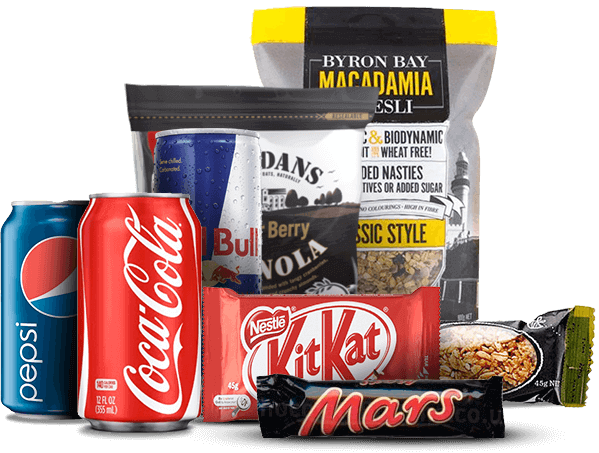 We offer a huge range of product selections from all the popular brands, and the best thing is when you have one of our lease-free vending machines at your workplace, you get to choose what goes in it.We have all the traditional snacks such as chips, chocolates and lollies, all your favourite soft drinks and juices, plus the option to mix and match with healthy snacks and drinks for those who are watching the calories. 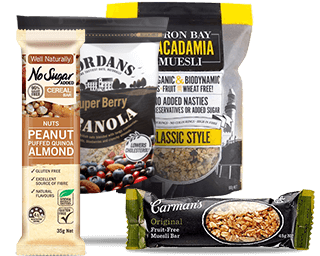 We have all kinds of snacks and drinks that taste great and are good for you too, including low carb chips, rice crackers, sultanas, nut bars, and muesli slices. We also stock water, milk, and vegetable and fruit juices, plus a range of diet soft drinks and energy drinks. 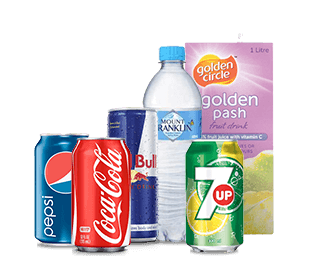 Choose from a big range of soft drinks, including Coke, Pepsi, Solo, Red Bull and 7-Up. We also have a big selection of juices including apple, orange and black currant, plus water, iced tea, and flavoured milk. 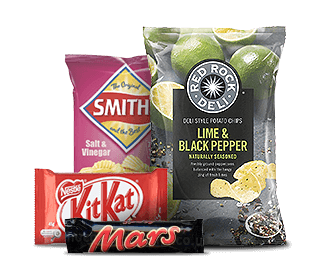 These include all major brands of chips and crisps, including Smiths, Kettle and Red Rock Deli plus Twisties, Pretzels, and CC’s for that savoury bite. We also have all your favourite chocolates, including Freddo Frogs, Picnics, Mars Bars and Kit Kats. Vending machines have come a long way from the clumsy clunkers that swallowed your money and jammed all the time. Today’s machines from Your Choice Vending are classy, compact, user-friendly, and look good in any location. And best of all, they’re very high-tech, offering eco-friendly energy saving features and Vend Detect technology that doesn’t take your money until your selection has been delivered. 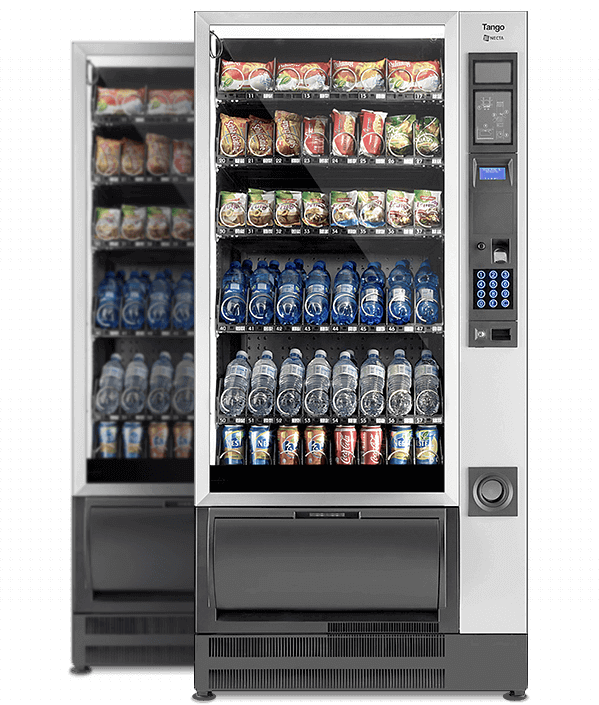 At Your Choice Vending, we want to make vending machines an easy, hassle-free experience. We’ll install and maintain our machines in your workplace lease-free as well as restocking (with your product selections), service and repair them free of charge, with a same-day response if something goes wrong. So if you have more than fifty people at your Sydney site and would like a free vending machine for your staff and customers, contact us today at Your Choice Vending. Arranging your free onsite assessment for a vending machine is easy. Simply fill in the form below and one of friendly staff will get in touch within 24 hours to discuss your requirements. We can also come out to your premises to help you decide where you want your machine and what you want in it. It’s all part of the service at Your Choice Vending, where it really is your choice every time.